…were one and the same yesterday, at least for part of the day. Motor Man and I decided to visit an antique mall in Williamsburg and rode the ferry linking Surry County to Jamestown. It poured rain for most of our trip there, including part of the approximately 20 minute ferry ride. But, the skies were beginning to clear just a little as we met the other ferry, making the return trip from Jamestown to Scotland Wharf in Surry. 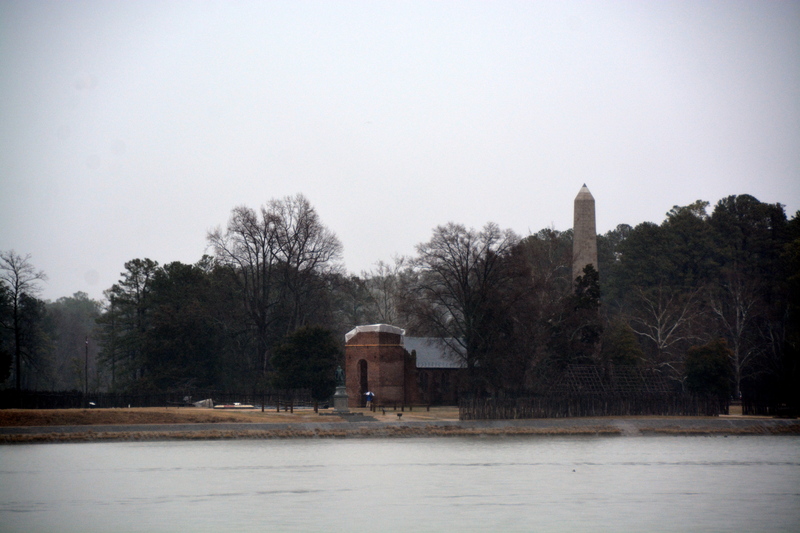 We thought the setting was particularly striking yesterday for the Jamestown Church Tower (c. 1690’s). It appeared to be wearing a rain bonnet as it undergoes restoration. Browsing through the antique mall seemed more nostalgic than usual. I saw sheet music for Winter Wonderland and Silver Bells, and recalled playing those songs on the piano many years ago. I also spotted a book of stories by O. Henry and glanced through it for The Last Leaf (and found it). I recall that from school days, as well as O. Henry’s surprise endings. The music in the mall is mostly instrumental, with an occasional Johnny Mathis, Brooke Benton and the like… it provides the perfect atmosphere. 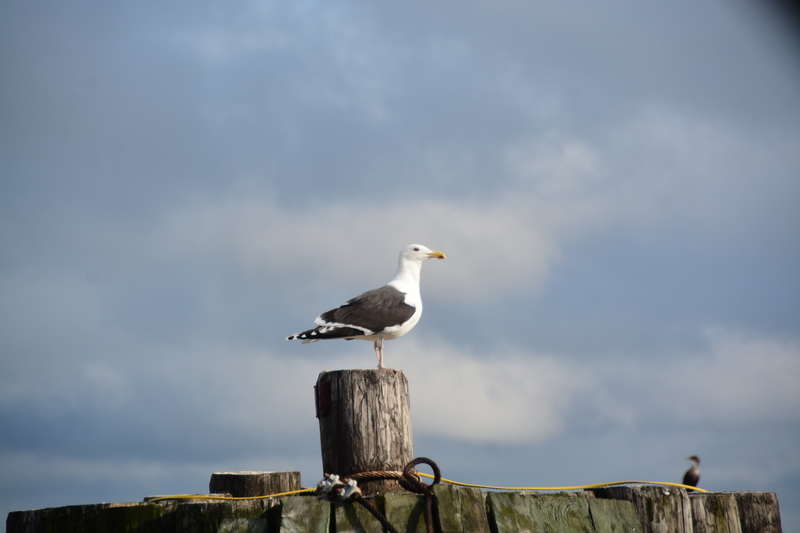 The weather was much improved for our return trip, where, as usual, a gull greeted us as we boarded the ferry. Did I purchase anything at the mall, you may ask. Tune in tomorrow! This entry was posted in Family, Traveling Days and tagged brooke benton, jamestown church tower, Jamestown Scotland Ferry, johnny mathis, seagull on dock, williamsburg antique mall. Bookmark the permalink. That’s a great mall, isn’t it? I can’t wait to see your latest treasure, Dianna. Hmmm—a teaser, huh? What did she buy? I am trying to imagine. Will be back tomorrow! I love how you and MM take such good advantage of all there is to see and do in your neck of the woods. Oh we all know you to be unable to go to an antique mall without getting SOMETHING!! LOVE that mall – we’re considering going back again today!!!! YES, we’re addicted! Love the photos – the scenery never gets old. Sounds like the perfect day, an atmospheric ferry ride, antiques and our kind of music. 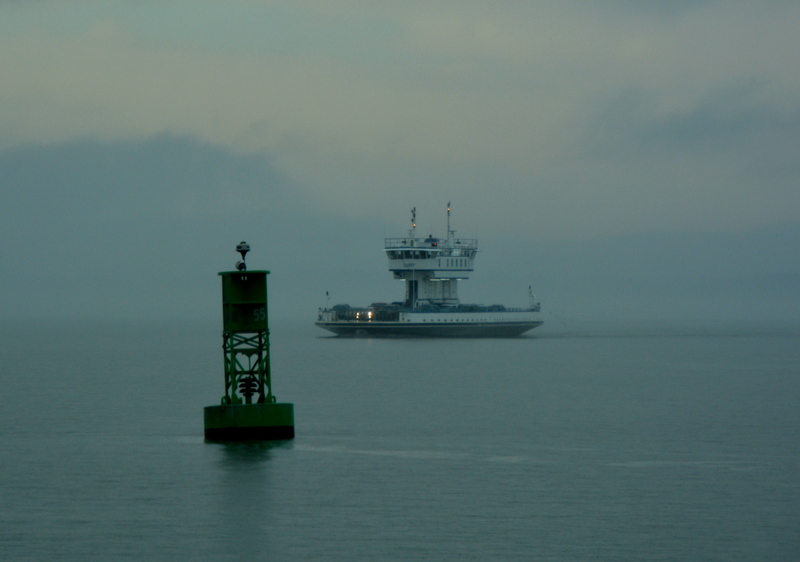 Glad the ferry ride wasn’t like the one we rode with pea-soup thick fog! Can’t wait to see what you purchased. I know it has to be fabulous. A trip via ferry to the antique mall sounds like a perfect way to spend a rainy Sunday. We went to the public library Saturday and guess what book I took off the shelf?? A collection of O.Henry short stories. I already had six books for check-out though, so I decided to get it next time. It’s been a long time since I’ve read those. That is quite a coincidence, Cindy! Or, as Marshall and I call them: a synchronicity! The sheet music would be a great background for your cards. i like that foggy view! I love riding the ferry in any weather. Great photos. Another great day trip ! I’m glad to see the church tower is receiving some much-needed work … love the gull shot ! The ferry is one of my favorite public transportation. I have many good memories of the Jamestown Ferry. Will be waiting to hear what you purchased. Great picture. I’m going to have to investigate that mall. I’ve never been there and we go to Williamsburg every couple of months. The picture on the ferry was beautiful. Loved the feeling of it. I love O. Henry’s writing.